There she is again, on yet another Friday night. She sits alone on her bed in her college dorm. Her roommate is on a date and, to her, it seems like everyone else is, too. A sudden knock at the door interrupts her depressing thoughts. She sulks to the door and opens it. “Hey, Kate! I just thought I’d drop by and check in on you.” Her best guy friend Kurt greets her cheerfully. She manages a smile, but he sees right through it. “What’s wrong?” Kate avoids eye contact and goes back and sits on her bed. Kurt follows her and sits down next to her. “Are you going to tell me?” Kurt and Kate have a special friendship where they care for each other a lot. It doesn’t seem that they like each other as more than friends, but that could change. “Kurt and Kate have a special friendship where they care for each other a lot. It doesn’t seem that they like each other as more than friends, but that could change. “Kurt, I’m a junior in college. I’m 19 years old!” Kate says. “I know you ar. What’s your point?” She opens her mouth to explain, but decides against it. “Come on, just tell me!” Kurt pleads. “No, it’ll sound dumb!” Kurt puts a hand on her shoulder and says, sincerely, “Nothing you say is dumb, Kate.” She sighs. “Fine, I’ll tell you.” He smiles triumphantly. “It’s just that, I’ve never been on a date before, and I get lonely.” Kate doesn’t meet Kurt’s eyes when she says this. “I had no idea it bothered you so much. You’ve mentioned it before but I…I just didn’t know. I’m sorry.” Kate remains silent. A few seconds later, Kurt jumps up. After Kurt leaves, Kate begins thinking about where she wants to go on their date. Since this will be her first date, she wants it to be memorable. She begins brainstorming her ideal date and, 15 minutes later, she has it all planned out. They can go to Applebee’s for dinner and then go back to her dorm and watch a movie. It may seem simple but, in her mind, it’s perfect. She shoots a quick text to Kurt to let him know what she wants to do. A few minutes later he texts back, ‘That sounds great! I have Jaws if you want to watch that.’ Kate laughs to herself then texts him back saying, ‘I’d love to.’ With their plans set, they both decide to go to sleep. They have a big day ahead of them. The next morning, Kate awakes to the sound of her roommate bustling about their dorm. Still tired, she opens one eye to see what exactly it is that her roommate, Jessie, is doing. She sees that Jessie is in the bathroom doing her hair and makeup. She’s probably going to see her parents over the weekend. “What time is it?” Kate mumbles. Jessie hears her and comes out of the bathroom, curls bouncing. “It’s 11 o’clock, sleepy head!” She says perkily. Jessie has boundless energy which is sometimes a little too much for Kate. She’s like a wild animal you just can’t tame. She’s harmless, though. Since Kate and Jessie have been roommates for three years, they’re pretty good friends. “So what’d you do last night?” Jessie asks. Kate stumbles out of bed. “Nothing much. But I do have a date tonight.” Jessie, who had returned to doing her hair, drops her curling iron and it barely misses hitting her foot. “You have a date?” Jessie asks, obviously surprised. Kate just smiles and nods, casually. “Who’s the lucky guy?” Kate blushes. “Do you remember Kurt?” She asks. Jessie’s face lights up. “I knew there was something between you two! You just can’t deny chemistry like that!” Kate gets a puzzled look on her face. “Really? You think so?” She had never really seen Kurt in that way. She thought that he was just taking her on a date to be nice. But what if it is more than just that? Kurt knocks on her door right at 6 o’clock. The door opens and he is face-to-face with a version of Kate he’s never seen before. She looks stunning! Eventually he finds his voice. “Are you ready to go?” He chokes out. She smiles. “Yes, I’m starving!” As they walk to Kurt’s car, they talk like they always do. There’s no awkwardness between them, and conversation comes easily. The drive to the restaurant is no different. It’s just like two friends hanging out. Except it’s not. It’s so much more. They arrive at the restaurant about ten minutes later, and are seated immediately. They order their drinks then look over the menu. “What do you want to get?” Kurt asks her. She shrugs. She’s heard of girls being one of two ways on dates: either they order a salad so they don’t seem like they eat too much, or they order what they want and hope the guy accepts them for who they are. The latter should come naturally to Kate since she’s out with her best guy friend but, suddenly, she’s nervous and afraid he’ll judge her. When the waiter comes to take their order, she makes her decision. Kurt orders the chicken tenders and Kate decides on pasta. While they wait for their food to come they begin talking. Unlike before, it is a little awkward, now that they have both acknowledged that they are on a date. This isn’t like the other times they’ve gone out to eat together. More afraid of silence than awkward conversation, Kurt speaks up with a cliché date question. “So, what can you tell me about yourself?” Kate giggles. “That you don’t already know? Not much.” “Okay, well tell me about yourself before college.” Strangely enough, Kate had never really told Kurt anything about her life before she started college. “Um, not much has changed.” He just looks at her. “I don’t believe you.” He challenges her. “It’s true!” “Is there anything that you miss?” This gives her an idea of what to talk about. “I miss my dog. In general, I miss having a pet.” Kurt probes her to tell stories about her beloved schnauzer, Bella, and she does. The awkwardness melts away as Kate makes Kurt laugh with her recounts of Bella’s crazy behavior over the years. When she is in the middle of telling Kurt about the time Bella made her chase her around the neighborhood, the waiter arrives with their food, forcing Kate to postpone her story. They continue to talk while they eat their meals and, once Kate can’t think of any more funny stories, she passes the conversation off to Kurt. “What I miss the most would have to be the town I lived in. It was such a fun little place.” This leads into a conversation about each other’s childhood. They learn a lot about each other that night. But not in the typical first date way. Rather, in a way that paves the road to something much greater for them. Once Kurt and Kate get back to her dorm they make some popcorn as she puts Jaws into her laptop for them to watch. Armed with a bowl of popcorn they sit down on her bed with the laptop in front of them. They start the movie and watch for a few minutes before Kate gets scared. To his utter surprise she scoots right next to him and lays her head on his chest, holding on to him to make her feel safe. Hesitantly and unsure, Kurt wraps his arms around her and pulls her closer. As it gets to the scary scene, Kate looks up at Kurt. “Aren’t you scared?” She asks him. He looks her straight in the eye when he answers her. “Terrified.” But it’s not the movie that he’s scared of; it’s his newfound feelings for his best friend. *This story was inspired by the Season 8 Friends episode “The One Where Joey Dates Rachel”. This entry was posted in Other and tagged college, date, dorm, feelings, food, friends, love, movie, New, story. Sometimes it’s hard to forgive people when they’ve hurt you a lot. We often think that they don’t deserve to be forgiven because of what they’ve done. Honestly, none of us deserve to be forgiven. But God has chosen to forgive all of us. Ephesians 4:32 says ‘Be kind and compassionate to one another, forgiving each other, just as in Christ God forgave you.’ God sent Jesus as atonement for our sins. Back in the Old Testament, people had to sacrifice a lamb every time they sinned. Jesus was called the Lamb of God because He was sent by God to be the ‘lamb’ that paid the price of our sins, so that we will never have to sacrifice a lamb again. God has forgiven us for our sins. He did thousands of years ago when He sent His Son to die on that cross. Now He wants us to forgive those who have sinned against us. Matthew 6:14-15 says ‘For if you forgive other people when they sin against you, your Heavenly Father will also forgive you. But if you do not forgive others their sins, your Father will not forgive your sins.’ Did you know that? Or did you just think that you could go on sinning and have God forgive you every time without you having to forgive others? The Bible says that when we sin, we sin against God. And even though we sin against Him, He forgives us. Likewise, when others sin against us, we should forgive them. If we don’t, then we won’t be forgiven by God. So no matter what it was that person did, no matter how much they hurt you, you must forgive them. You may think that they don’t need for you to forgive them. And that may be true. I’ve been in situations where the person I needed to forgive couldn’t care less if I forgave them or not. Sometimes they didn’t even know they did anything wrong. Either way, we have to forgive them. No, not for their sake, but for ours. We may not know it at the time but, by not forgiving someone, we have this bad feeling inside of us because we know that we should forgive them. When you forgive them, it actually makes you feel better; it lifts a burden off of your shoulders. So next time you’re in a situation where you need to forgive someone, don’t be hesitant to do it. Remember that God has forgiven you time and time again, and He wants you to forgive others, too. This entry was posted in Devotions and tagged cross, forgive, forgiven, forgiveness, free, God, Jesus, Lamb of God, love, sacrifice. This entry was posted in Other and tagged bridge, clearance, fighting, funny, insult, mean, neighbors, river, story, whoop. Unrequited, unreturned, love is something I’m sure we’ve all faced at some point in our lives. When you like someone and they don’t like you back. For some of us, when that happens, we look in the Bible to see what it says about it. Many people believe that the Bible doesn’t say anything about things like unrequited love. But when you look a little closer you see that it actually does. Maybe it doesn’t say it in the way you’d expect, but it does say it. First, we must remember that Jesus has experienced pain, too. So when we are hurt by things, in this case, unrequited love, it’s important to remember that Jesus knows what it’s like to be hurt. John 1:10-11 says, ‘He was in the world, and though the world was made through him, the world did not recognize him. He came to that which was his own, but his own did not receive him.’ Unrequited love is a form of rejection. And Jesus has been rejected, too. He loves everyone, the entire world, but they don’t all love him. He gave them a choice to love him or not, and some have chosen not to love him. It’s the same with us. We can try but, honestly, we can’t make someone like us. We can be ourselves and hope that they like us but, in the end, it’s their decision. It’s their choice. We have given them a choice to like us or not, just as Jesus has given them a choice to love him or reject him. Jesus has been rejected by millions of people. But instead of focusing on that, he focuses on those who do love him. And we should do the same. So the next time you like someone and they don’t like you back, don’t feel bad! It doesn’t mean that there’s something wrong with you! Just as they chose not to like you, you should choose to focus on those who do like you: your family, your friends, and, most importantly, Jesus. Jesus loves you more than anyone ever can! He loves you so much that he died for you! He loves you unconditionally! In your life there will people that don’t like you. But just remember how much Jesus loves you. This entry was posted in Devotions and tagged Bible, Bible verse, choices, crush, hurt, Jesus, life, love, rejection, unrequited love. This entry was posted in Pictures and tagged Bible, Bible verse, God, Jesus, John 3:16, love, never alone, saved, Valentine, Valentine's Day. Isaiah 48:10 says ‘See, I have refined you, though not as silver; I have tested you in the furnace of affliction.’ Trials are often said to ‘refine’ us, and this verse confirms that. Affliction means trials so, when God says He tests us in the ‘furnace of affliction’, He means that He tests us through the ‘fire’ of our trials. Just as silver is refined when put through fire, we are ‘refined’ when put through trials. God puts us through trials to help make us better. He also tests us through our trials which means that He uses trials to test our faith. When we go through hard times God wants us to turn to Him for help. Some of us do, but others shun Him because they are angry that He has placed them in that trial. It is when we ask for his help, though, that He will bring us through our trial. We just need to trust Him. In my experience, I have always learned a lesson from my trials. My trials have always refined me and made me a better person. It’s important to know that God doesn’t give us trials to hurt us, He gives us trials to help us. Sometimes in life, by the decisions we make, we put ourselves through hard times. But, when that happens, God will use that to make us better. Recently I went through something and it was my own fault that I went through it. But God used it to help me learn a lesson and He refined me through it. So, whenever you are facing a trial, know that God will use it for your good. He will refine you! This entry was posted in Devotions and tagged Affliction, Bible, Bible verse, Faith, Fire, God, Isaiah, Isaiah 48:10, Refined, Trials. 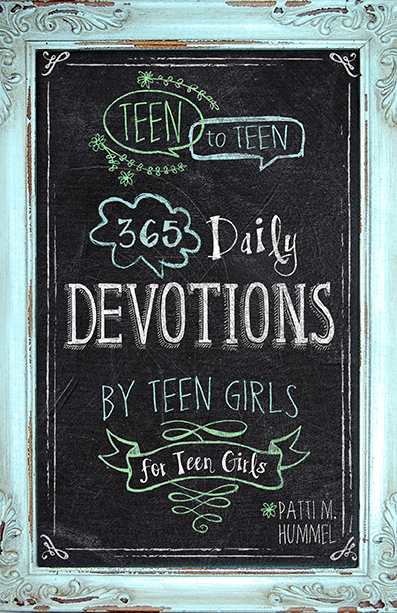 God allowed me, along with many other teenage girls from all over the US and beyond, to be a contributing writer for B&H Publishing Group’s Teen-to-Teen: 365 Daily Devotions By Teen Girls for Teen Girls. 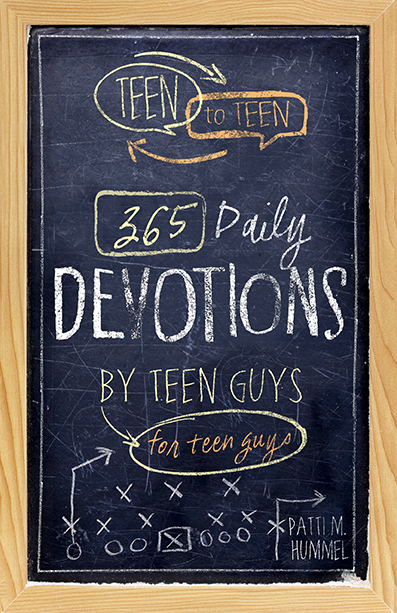 It and the boys’ edition, Teen-to-Teen: 365 Daily Devotions by Teen Guys for Teen Guys, were released in November of 2013 and are available at Amazon.com, Lifeway Christian Stores, Mardel Stores, Barnes & Noble, and most Internet stores as well as other Christian stores. The devotions contain personal stories and reflective thoughts that are inspiring and uplifting. I highly recommend it for girls who enjoy some daily encouragement. So go check them out! If you are touched by the messages in these books please post a review on some of the sites where they can be purchased. Remember, these books make great gifts! This entry was posted in Other and tagged 365 days, book, Christian, Devotion, encouragement, God, New, teen girls, teen guys, writing.